If you’ve been reading this blog for a while, then you’ll know that the poems of Hopkins have always spoken to me. I think this was the first poem of his I read as a teenager and I’ve always loved it. Perhaps the concept of the wellspring began here for me. I do not know. I have written extensively about springs, wellsprings and the metaphysical meanings and implications of both. I’ve used the idea of groundwater seeping deep and then eventually springing back up, purified and revivified, as a metaphor for the creative process. I’ve written an entire novel (Strangers and Pilgrims) about a healing spring, the waters of which will heal broken hearts and spirits. But I have begun to lose heart and hope. In the wake of the general election, in the face of the continued wall of horror that is the news, and in the constant onslaught of things I can do nothing to mend, I have begun to buckle. I cannot carry the world’s woes; I cannot even manage to carry my own personal woes very well now, and they’re trivial by comparison to what many bear each day. A few weeks ago, though, I found a wellspring. I didn’t happen upon it; rather my husband had been taken to it as a part of something else entirely and he was so struck by it that a few days later we went back. You would not find it readily; deep in woodland, with no visible paths, you had to know it was there to find it. 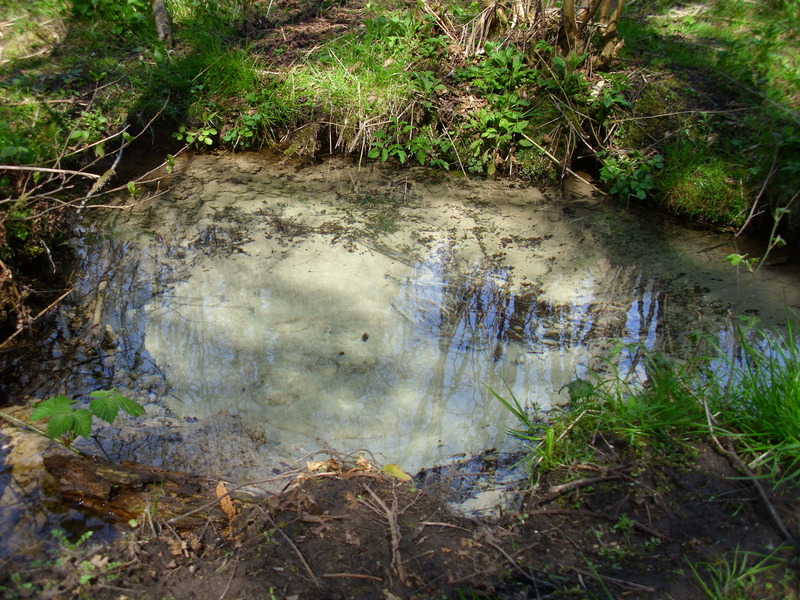 At one time, this spring and others in the same lands, supplied all the freshwater needs of Ipswich. Around six feet across, roughly circular, and entirely unexpected, it was filled with water so incredibly clear it was invisible. At the bottom of the pool, perhaps three or four feet deep, the spring itself bubbled up in a constant and quite mesmerising pattern of churning up the sand. Viewed from above, it looked a little like a volcano erupting with ash. Shining specks of mica and quartz gleamed as the spring poured into the pool; pure white shells of ancient molluscs turned over and over before being lost. The pool spilled over into a stream that chuckled and sang and ran on under moss covered branches. It was like another world, and one I’d forgotten existed. The water was icy cold, and sweet to taste and if the day had been warmer I might have bathed in it. I cannot rationally explain why this place lifted my spirits and the memory of it continues to do so. Nothing in my world is changed materially by it. Logically I know that such springs exist but it is the experience of being close to one that reminds me that there are things that do not fail and fall away when we do. I do not know whether my own creative springs will ever be restored, but I still desire in my heart of hearts to go “where springs not fail.” And that, with faith, has to be enough. Once or twice in my life I have made a decision while under the influence of alcohol. Most of us have, if we’re honest about it and if we’re lucky nothing very untoward has come of it. The most life changing decision I almost made was on the strength of exhaustion, the exhilaration of moving to a new and very rural area, a childhood dream and several pints of Scrumpy Jack cider. Thankfully, I said I would sleep on it and come and view the horse the next day. Good sense kicked in with a mild hangover and though the horse was beautiful as a de-horned unicorn she had not been broken in and on the strength of the fact that I’ve never owned a horse before, let alone broken one in to bit, bridle and saddle, I said no. I am relieved now that I didn’t go through with the purchase as I suspect it would have led to much heartache later. I’d also learned my lesson from something that had occurred in a pub about six years previously, though in that case it was the result of a pint and a half of Guinness and some persuasive friends. It was a bit more than that really. My husband had been accepted for ordination training a few months previously, to commence to following autumn, and life was in a kind of free fall. We were gearing up to moving from Middlesbrough to Nottingham, selling our home and renting another and at this time our daughter was about 18 months old. There were so many uncertainties my head spins now to even think about it. We belonged to a Fellowship of Vocation group that supported those considering or entering ministry and it was after such a meeting that we decided to capitalise on having a babysitter and when the core of the group decamped to the pub afterwards, we joined them. David, the group leader, was a Taizé fanatic and he set himself to convincing us to come that year. Taizé is a religious community in the far south of France famed for its music and its silence. Young people from all over the world visit for a kind of retreat. My objections were simple: we had virtually no money and we had a baby. Money? Ha, as we were at that time under a key age, we were able to pay the bare minimum, David told us. And there were lots of activities for children and so on. When the time came, I regretted the decision immensely. We were in the throes of selling our house and I was reluctant to go away at a crucial time. But we’d paid our initial deposit for coaches etc so we went. Let me tell you something: travelling from the North East of England to the South of France on a coach with a hyperactive two year old who doesn’t sleep was possibly one of the most challenging experiences. It took a full 24 hours and the last 12, driving across France was horrific. It got hotter and hotter. By the time we got there, the temperature was in the 80s. I had had no sleep whatsoever and I don’t like heat anyway. Since I speak French, I sorted out where we were to be billeted and we trudged half a mile up the road to the farmhouse where those infirm or with tiny children were put. We found out later a minibus would have ferried us there but no one thought to tell us. The old farmhouse was lovely, but in a state of some disrepair and the girl who was there to welcome us was Hungarian and spoke only basic English. She showed us to our room, which turned out to have a stone flagged floor and one single bed. At this point, I sat down on the bed and burst into tears. “We have a problem,” said the girl and left us alone. Ten minutes later she came back with a very nice nun who spoke good English and found us first a room with two beds, and then a travel cot for the baby. I didn’t like Taizé; it was full of too many people, and too much noise and bustle and confusion. I felt miserable and confused myself and I wanted to go home, desperately. I liked the Church, with its icons and its flickering candles but I didn’t like the service I went to the first evening. Hypnotic repetitions of simple songs wound my nerves up to breaking point and I could see everyone else falling under the sway of it, becoming entranced and I felt angry and excluded. I tried to get into the spirit of it but couldn’t. Total fail. We also had to share child care because it turned out at just short of 2 years old our daughter was considered too young to be in any of the kid’s activities without one of us being present. So we had to turn and turn about participating in services and study groups. We’d been there about three days, and I had become resigned to being there and was just keeping my head down and trying to get as much out of it as I could. I felt a massive sense of disappointment; it was just not what I had hoped it would be for me. I blamed myself, because I’ve always been useless at anything with groups. Then my husband said, have you found the Chapel of the Wellspring yet? Simple answer, no. I’d not even known it was there. I went and looked at it next time it was my turn to be baby-free. It looked…..intriguing. It looked like a cross between a B&Q summer-house and an Orthodox church. A rough wooden roof over decking but an onion dome on the very top. I stood for a moment looking at it. Inside, candles flickered by icons and in the middle was a trough of water. I went in and sat down. There were only benches or prayer stools and it was simply nice to be out of the glare of the sun. The little structure was filled with the fragrance of cedar-wood and of the branches of box that were stapled to the frame (I still don’t know why) and the sweeter smell of candles. The birdsong outside was muted and after a few seconds I could hear only a trickle of water. Below this structure was a real spring and the water was channelled from below into the stone trough at the heart of the little chapel. The heat of the day was so intense that the slow trickle of water from deep in the earth kept the trough filled but it rarely overflowed. After I had sat there for a while, I could smell the water: cool, and fresh, filtered through layers of ancient rock and earth. I went and knelt by the stone basin that held it and touched it. The refreshment went somehow beyond the coolness of water on a hot day; the water felt newborn and ancient at the same time. I did not drink, but I did touch my face with the water. From that point on this place became my touchstone for getting to grips with whatever was raging inside me. I would come in and sit in silence and after a short while what had bothered me had melted away. There was a power there I cannot describe, and even writing about it now, I feel the silence and hear and smell the water. Before we left to go home, I bought a pendant with a simple representation of the wellspring, two lines of waving blue and it came with a tiny card that has sat on or near my desk in the 20 or so years since then. I’ve wished every day since we left that I had that Chapel of the Wellspring somewhere that I could visit every day; wanted to live in a home where the garden held a spring I could meditate by and be healed constantly of the pain life can bring me. It’s taken me those intervening twenty years to start to understand that in reality, I do. It’s frustrating on so many levels. On the first level, it’s simply baffling to the person being questioned. To be asked to single out an actual cause for how you are feeling is very stressful, because the first answer that you’d prefer to give is, “I don’t know.” The onus is on you to provide an answer that the asker can understand, and the simple fact that there IS an onus on you to do that is deeply distressing. You don’t ask someone with cancer what do you have cancer about. You just do. It’s the same with depression. Of course, the fact is that many people do not understand what depression really is. They think it is the same thing as unhappiness, and has an identifiable cause and an achievable cure. So you flounder to name triggers for the current bout of depression in the hopes that someone will nod with understanding, and stop asking such silly questions. I know for myself I often try to name a trigger because I know that the person asking cares and wishes to help; naming an external force is a way of opening up a space between us that continues the discussion and maybe eases some of the loneliness of soul I often experience. People who care are often keen to offer solutions and advice and if you’re anything like me, you may seek to allow them that solace of feeling less helpless. But there are occasions when you try to explain your triggers and someone looks at you blankly, unable to understand quite why something that seems trivial to them could cause such pain in you. I’ve found it interesting quite how many people did understand why those daffodils caused me to break down, and how many did not. Here’s some information about this type. I found it spot on. “But the INFJ is as genuinely warm as they are complex. INFJs hold a special place in the heart of people who they are close to, who are able to see their special gifts and depth of caring. INFJs are concerned for people’s feelings, and try to be gentle to avoid hurting anyone. They are very sensitive to conflict, and cannot tolerate it very well. Situations which are charged with conflict may drive the normally peaceful INFJ into a state of agitation or charged anger. They may tend to internalize conflict into their bodies, and experience health problems when under a lot of stress. I’m choosing to share this because it helped me to discover that the way I am is recognised and understood by a body external to my own circles. One of my primary experiences is that of empathy. INFJs are capable in ways most types are not of making the jump to understanding the feelings of others without having to experience the same things. I recently had a review of my novel Strangers and Pilgrims where the reviewer felt that only two of the characters had “real issues” and that the rest were “wallowing in self-pity and needed to get a grip.” Their internal distress simply did not register because the causes for it would not have provoked the same reaction in the reviewer. I found this a curious response, really, because I’ve always felt that someone else’s internal processes are uniquely theirs and while sometimes I don’t feel that what would upset someone else would upset me, I’ve always respected that it did genuinely upset them and that it is a real cause for distress. Let me give an example. Around twenty or so years ago, I lost a pregnancy through a miscarriage. Once the hormonal balance was restored, I didn’t feel much grief about it. I do sometimes wonder about that child that never was, but I do know plenty of women (and men too) for whom a miscarriage is a lasting wound that never quite heals. They mark the passing years, with memorials for the child’s probable birthday and the day of the loss. While I share that experience of losing a baby in pregnancy, I don’t share the same experience of grief, but I never doubt that their grief and their pain is real and powerful. It’s far from unusual to have people commit suicide or attempt it without those around them ever quite registering what has been going on inside their minds. And if they do express what has motivated them to try this desperate act, others often fail to understand why what seems to them merely an inconvenience or an upset could make another person try to kill themselves. It’s the qualities of empathy and imagination that give us the ability to step into another person’s skin and see what they see and feel what they feel. I suspect it is the lacking of both these qualities that feeds into the general uncaring so prevalent in society. When someone next says, “Oh grow a pair and toughen up,” perhaps it’s worth remembering that some of us are capable of much greater empathy and imagination than others, and then smile and silently pity the speaker.